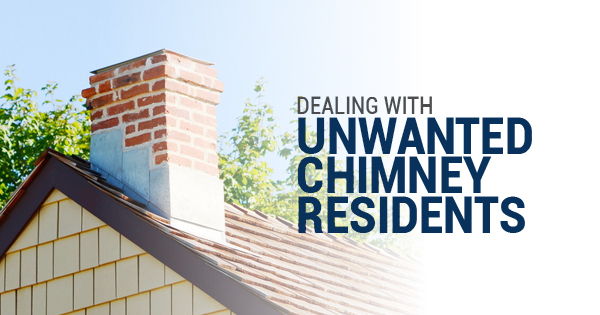 Your chimney is the ideal spot for unwanted rodents and other critters to wander into — they’re often uncovered, dark, and unfortunately they’re easy to accidentally become stuck inside. Some common chimney trespassers are birds, squirrels, mice, bats, and raccoons. All of these creatures can potentially be stuck in the chimney or find their way into your home, especially small and nimble animals like mice. You definitely want to avoid mice and rats getting into your house proper for health reasons; they love to poke at people food, and the National Pest Management Association even estimates that rodents like mice and rats consume or contaminate up to 20% of our global food supply. Yuck. Noises like scratching, flapping, and vocalizations. Debris showing up in the flue or bottom of the fireplace. You see one or more animals (like a nesting bird) entering or exiting your chimney outside. If you can see a live or dead animal in your fireplace, it’s highly recommended that you call animal removal professionals for proper, safe removal. Professionals in wildlife control and animal removal are educated on diseases and risks that come from wild animals, and have the proper equipment to deal with them. Close the flue if animals are high up in the chimney to prevent them entering the house. DON’T try to ‘smoke them out’! After any animals have been removed, first you should make sure you have your fireplace and chimney swept out. Droppings and nesting materials shouldn’t be left behind, as they pose a health hazard AND a fire hazard. Second, check for any structural or water damage. Nests in a chimney are bad news for the bricks as nests can accumulate moisture and promote the crumbling of brick materials used in most chimneys. Third, check for openings that invaders like rats and mice could have squeezed through to reach your chimney. See if it’s time to have your roof and attic inspected — you should have a roof inspection once every year or two anyway. Lastly, when your chimney is free of invaders once again, invest in a good chimney cap to keep out critters and debris. Don’t accidentally invite more unwelcome squirrel families and other destructive animals!